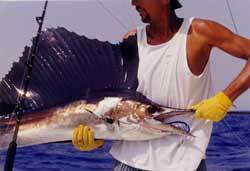 The Caribbean waters off Mexico are home to dorado (mahi mahi), sailfish, white and blue marlin, snapper, slammer dolphins, blackfin, skipjack, yellowfin tuna, kingfish and wahoo, depending on the time of year. There are charter boats available for year round deep sea fishing. Saltwater flats fishing has become a year-round pursuit for light-tackle anglers across the world. If you haven't felt the searing run of a bonefish as it peels off 100 yards of line in a single run, the brute strength of the permit, or the acrobatic flight of a tarpon, your angling experience is simply not complete. Mexico has world class flats fishing of all types. Tropical Mexico: The Ecotravellers' Wildlife Guide A guide to the flora and fauna of Southern Mexico.